A warlock’s invocations are spell-like abilities; using an invocation is therefore a standard action that provokes attacks of opportunity. An invocation can be disrupted, just as a spell can be ruined during casting. A warlock is entitled to a Concentration check to successfully use an invocation if he is hit by an attack while invoking, just as a spellcaster would be. A warlock can choose to use an invocation defensively, by making a successful Concentration check, to avoid provoking attacks of opportunity. A warlock’s invocations are subject to spell resistance unless an invocation’s description specifically states otherwise. A warlock’s caster level with his invocations is equal to his warlock level.The save DC for an invocation (if it allows a save) is 10 + equivalent spell level + the warlock’s Charisma modifier. Since spell-like abilities are not actually spells, a warlock cannot benefit from the Spell Focus feat. He can, however, benefit from the Ability Focus feat (see page 303 of the Monster Manual), as well as from feats that emulate metamagic effects for spell-like abilities, such as Quicken Spell-Like Ability and Empower Spell-Like Ability (see pages 303 and 304 of the Monster Manual). The four grades of invocations, in order of their relative power, are least, lesser, greater, and dark. A warlock begins with knowledge of one invocation, which must be of the lowest grade (least). As a warlock gains levels, he learns new invocations, as summarized on the table described above. A list of available invocations can be found at the link below. could be least, lesser, or greater). At 16th level, a warlock can replace a least, lesser, or greater invocation he knows with another invocation of the same or a lower grade (in addition to learning a new invocation, which could be least, lesser, greater, or dark). Finally, unlike other spell-like abilities, invocations are subject to arcane spell failure. Warlocks can qualify for some prestige classes usually intended for spellcasters. The first ability a warlock learns is eldritch blast. A warlock attacks his foes with eldritch power, using baleful magical energy to deal damage and sometimes impart other debilitating effects. An eldritch blast is an invocation and is a ray with a range of 60 feet. It is a ranged touch attack that affects a single target, allowing no saving throw. An eldritch blast deals 1d6 points of damage at 1st level and increases in power as the warlock rises in level. An eldritch blast is the equivalent of a 1st-level spell. When a warlock uses a blast shape and an essence invocation to alter an eldritch blast, the spell level equivalent is equal to the spell level of the eldritch blast, the level of the eldritch essence invocation, or the level of the blast shape invocation, whichever is higher. An eldritch blast is subject to spell resistance, although the Spell Penetration feat and other effects that improve caster level checks to overcome spell resistance also apply to eldritch blast. An eldritch blast deals half damage to objects. Metamagic feats cannot improve a warlock’s eldritch blast (because it is a spell-like ability, not a spell). However, the feat Ability Focus (eldritch blast) increases the DC for all saving throws (if any) associated with a warlock’s eldritch blast by 2. Small-size: A small rodent or lapid gains a +1 size bonus to Armor Class, a +1 size bonus on attack rolls, and a +4 size bonus on Hide checks, but also uses smaller weapons than humans use, and lifting and carrying limits are three-quarters of those of a Medium character. Light Build: Thanks to their slighter builds and more agile bodies, beastfolk with light build can use weapons and armor designed for creatures one size smaller without penalty, and can fit through tight spaces as though they were one size category smaller. Despite these advantages, those with light build count as their normal racial size for determining space and reach. This ability stacks with powers, abilities, and spells that affect size category. Frantic Scurry: When running, small rodents and lapids can move five times their normal speed if wearing medium, light, or no armor and carrying no more than a medium load, or four times their speed if wearing heavy armor or carrying a heavy load. If they make a jump after a running start (see the Jump skill description), they gain a +4 bonus on the Jump check. While running, they retain their Dexterity bonus to AC. This stacks with the Run feat, increasing each modifier by one (x5 run speed becomes x6 and x4 run speed becomes x5). Keen Hearing: +2 to all Listen checks. Variable Movement Types: A small rodent or lapid may choose to gain a +2 racial bonus to two of either Climb, Jump, or Move Silently, chosen at character creation. Mice and chipmunks generally take Climb and Move Silently, rabbits Jump and Move Silently, and squirrels Climb and Jump. She had once been a good little bunny. Spending her time amongst the burrow she was born and raised in being the 'big sister' to some thirty-seven brothers and sisters. She never once complained, having grown accustomed to helping her parents with the growing assembly of siblings from as early as she could remember. It wasn't until one fateful day when she was asked to leave the burrow, to trade some of her mother's famous carrot-cakes in the market within Avalon City in Therafim. She set up her stand right in the center of the market district, and awaited for a customer. It wasn't long before she found one snooping about, looking at those fine, tasty cakes! The little lapid popped her head up above the table, standing on tip toes. "Howdy-do! Can I help you, mis'ser?" The older man nodded softly and pointed to the cakes. "I would really like one of those delicious looking carrot cakes. Can you spare one for a broke man?" The little bunny fixed the glasses upon her nose, and thought it over. She knew her mother would be cross with her if she didn't sell the cakes and bring back money for the family. She was torn between pleasing her momma', and going against her sweet, naive side to deny a seemingly hungry man food. She softly sighed, then slowly nodded. "Very well, but only one, mis'ser! No tellin' others!" She lifted a cake and offered it to the man. He took it graciously and ran off. It wasn't long after her stand was flooded with bums begging, or simply just stealing. Before long, she had no cakes left, and not a single coin to her name. Oh, how momma' was going to be so mad! She couldn't help but find an alleyway to sit and cry upon, her little paws balled up and rubbing her eyes, sobbing pitifully. A deep, dark voice spoke to her from the shadows. "Oh, poor little rabbit. What do you cry for, child?" She looked up, her glasses dotted with tears as she looked through the little droplets upon the lenses. "Momma' asked me to sell cakes, but they all stole them! Now all my siblings will not have any money." She took her glasses off, wiping them off her shirt, then plopping them back on her nose, twitching it back and forth to get them to set comfortably, before her little beady black eyes could finally see who spoke to her. The figure was wrapped in dark garb, and bright red eyes shone from the shadows of his cowl. "Dear child, if you ask it of me, I will give you the money, and see to it the thieves are punished for what they've done." The girl blinked, then swiftly shook her head. "No~no! I could never hurt someone else! But, I can't go back without the gold…" The dark-clad being nodded its head and grinned, showing off a mouth full of sharp fangs. "As I spoke, I will give you the gold, and make sure they never rob again. In return, you must only do one little thing for me." A gnarled, twisted, clawed hand slid from one of his sleeves. Within that large hand was a pouch of gold coins, and a small amulet made of a pure gold chain, hanging from it a beautiful bloodstone. "Go run home, you need not even be in the city when the thieves are punished. Though, you must wear the amulet. That way, if I ever need something, I can find you. So that you may pay back your debt…"
The little bunny thought over these words, then slowly she slid trembling fingers out, curling them around the chain the amulet was hung upon. Slowly, she slid the amulet over her head, letting it fall between small breasts. Then she lifted the gold pouch from his hand and nodded his head. "Very well, mis'ser. It's a deal. Thank you." The dark figure simply smirked and laughed deeply. "Oh~no, thank you…" With that, he waved the little bunny along and disappeared into the shadow. Marcella was well on her way home before the first of the ghastly murders were discovered in the streets of Avalon. She ran home, never speaking of the interaction with the dark figure to her parents. She kept the amulet tucked between her cleavage, so she wouldn't be asked of it. Any time she tried to remove it, it would not come off. Seemingly fused to her very fur and flesh, though it was never uncomfortable for her to bear. It was the death of her innocence, the end of her naivety. When she awoke, she was a whole new person. Now cynical, dark, even twisted in a sort of way. She never washed the blood and gore from her body, instead allowing the rain to clean her as she trudged towards the city once again. She could already feel it deep within her, that little bit of Infernal essence left behind inside her after the Devil had taken over her body. 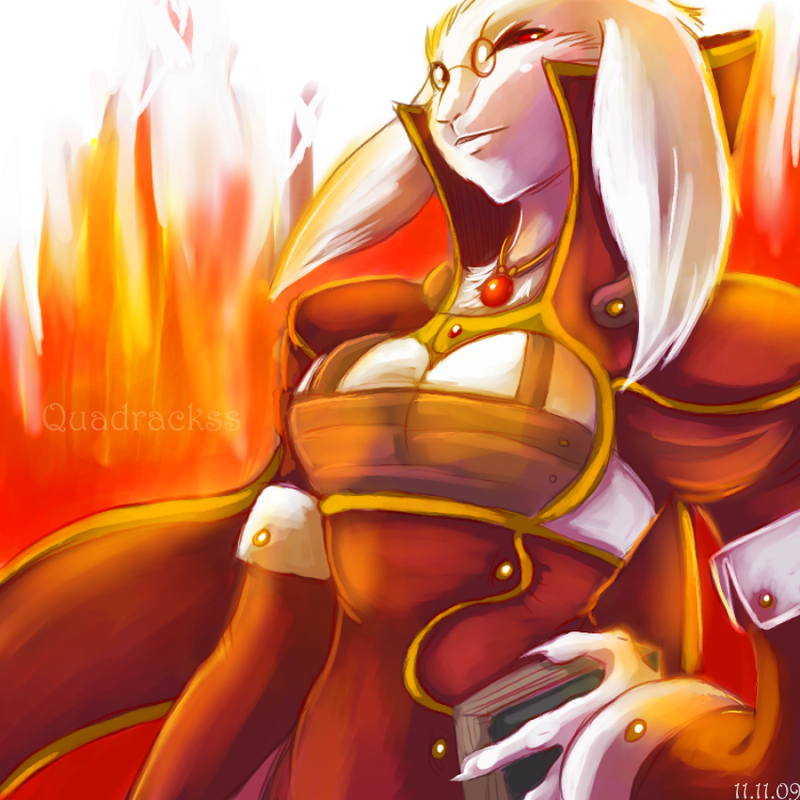 A power was beginning to well within the bunny, the first noticeable feature being her eye color having changed from beady black to blood red. When she stroked the amulet still fused to her, she heard the dark voices, the Infernal whispers that spoke to her of a destiny she must fulfill. By the time she was within the walls of Avalon again, it was the Warlocks who found her, as if they knew she was coming. So began her training, and three years later? Well, that is a story still left unwritten….